As the radiation wave strikes Raven, Clarke, and Bellamy lead a daring plan to escape into space on board Becca's rocket -- but must be willing to sacrifice everything to survive. Last edited by GateWorld; August 17th, 2017 at 09:44 PM. I liked the fight to survive for all, but was shocked they didn't spend as much time on the bunker as i would have hoped. I also liked that the team made it up to the ring. BUT what the heck was that ship that landed??? Aliens? It had some corporation name painted on it in English; "xxxxx corporation", so I doubt it's alien. My guess is an as yet unknown player entering the scene. Colonists originally from Earth, returning from someplace? After all, assuming the 1200 in the bunker didn't kill each other off in the 6 years that passed, they're probably beyond fighting with each other. So they have have to bring in some new group to fight with. "It may seem pointless but small talk is a vital dating skill. It helps to establish a rapport with your companion." "Perhaps there's something to be said for assimilation after all." Nothing in the show up to now, indicated we had that sort of tech, to send a ship to colonize anywhere else though. 100+ years ago, before Earth was rendered unlivable, they had the tech to build orbital space stations, apparently most major nation states had their own, and they eventually merged them together. They didn't appear to have any sort of FTL, but they certainly had reaction propulsion down. More than enough skills for travel to other planets within our solar system. One of the news article we saw when Jaha was looking for places for them to hide from the radiation spoke of an asteroid penal mining colony that earth has lost contact with. I'm guessing that where this ship came from. If that penal colony was on Ceres they could be a major civilisation by now. Last edited by knowles2; May 27th, 2017 at 11:48 AM. 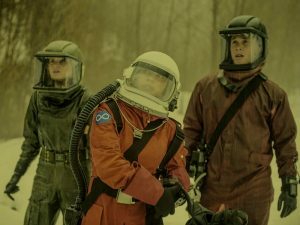 One of the news article we saw when Jaha was looking for places for their to hide from the radiation spoke of an asteroid penal mining colony that earth has lost contact with. I'm guessing that where this ship came from. If that penal colony was on Ceres they could be a major civilisation by now. Damned good attention to detail there. I think we've just come up with the rough outline for next year. Now, if we can just get them to write the details in so these newcomers aren't just some new group to fight with. Hm.. Which ep was that in? I might have to go back and re-watch it..
And with it being what. a year after the supposed opening of the 'arc' in the ground and no contact. Anyone bet they are dead? S4E3	"The Four Horsemen" I believe. OMG, I think I'm lost. HELP!!!! Well, I know I'm extremely late with this but I've just finished watching season 4 a few days ago and now that the rush of the first watch is gone, I was thinking about two points. The first is the bunker and how it's related too the grounders. Well, it was never addressed directly and I don't know whether it's obvious or not or maybe I just missed it. I believe the grounders are the descendants of level twelve of the cult who built the bunker and it would explain why they are susceptible to these grounders beliefs considering it's how they ended up there, especially when time passes and traces of science is gone since the original ones never taught their children about science, just their beliefs. I also believe that's how Becca managed to control them and become their first commander. She must have used that. Now about the second point, which is the prison transport. I was thinking, well, we haven't seen all of America. Maybe there are other survivors. But there is also a wider picture here. We assumed that only the Americans had survivors, but there are other countries in this world. Maybe they have their own survivors. Other countries could have built bunkers or went to space. And we also know there are mining colonies on different asteroids in the solar systems. Maybe they also had a prison out there. It could have been the prisoners who came back or someone who escaped Earth and used the prison as a place to wait out the 100 years and now that it's been 104 years, they can all come back. I don't know that's what I'm thinking now that it's been a few days since I watched the finale. But as we saw that Primfia blast was affecting the whole world. If those bunkers/other survivors were elsewhere, shouldn't THEY have been smashed too? well they would have their own bunkers. The only difference is, these ones could have gotten out after 6 years while the ones in Becca's crypt haven't. Or of course they could have also come from the mining colonies on asteroids in our solar system or maybe a space prison as I assumed in my previous post. I think that's more likely. Back to those other bunkers.. The reason the one we found was usable, was cause it was stocked.. The '13' never found/used it.. BUT those other places bunkers would have been used up.. AND would have had no advanced warning of Primafire..
why do you assume that? Maybe other bunkers were hidden in other places too. Maybe they knew about Praimfaya when the radiation sickness came. Someone could have connected the dots. My money is on Space prison, or as I like to call it Space Australia. Which would beg a lot of questions though. How come they never contacted the ark? Why would prison stations be the only other space settlement? Is the ark also formed from a Lunar orbital station? Surely the moon would have also had some sort of operation going. Also, I think the damage done is a bit too extensive...we are talking no real recovering much less capable of sustaining 1200+ people. But now our protagonists may very well be the grounders...interesting...I sure hope it's not just a rinse and repeat sort of story arc. That's my concerns as well.. WHY would they have waited all this time, not done a damn thing to help those on the arc/ground during the lead up to primfire etc..
Then there's the issue of what kind of society Space Australia is. Obviously there were women in that prison...is it possible that they were prisoners or workers? Or was it a woman's prison with male employees? Or a coed prison? Or more than one prison? Is the ship a life boat because where it came from is no longer viable? Would they not detect the ring were Raven et al are? Or not care? Or did they detect it and board it? So many questions.